Sarah Bowles and Andrew Gorell in RICHARD III. Photo by TOMMY THOMPSON. 2006. 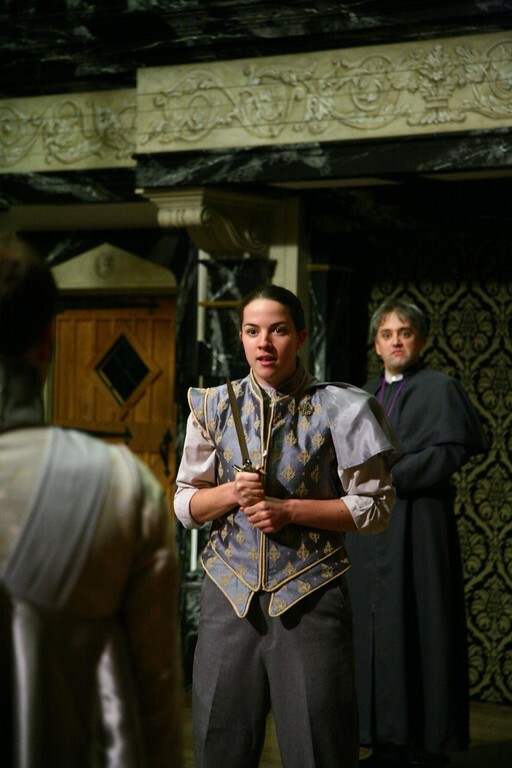 Tom Loughlin, Andrew Gorell, Gregory Jon Phelps, and Olivia Braza in RICHARD III. Photo by TOMMY THOMPSON. 2006. 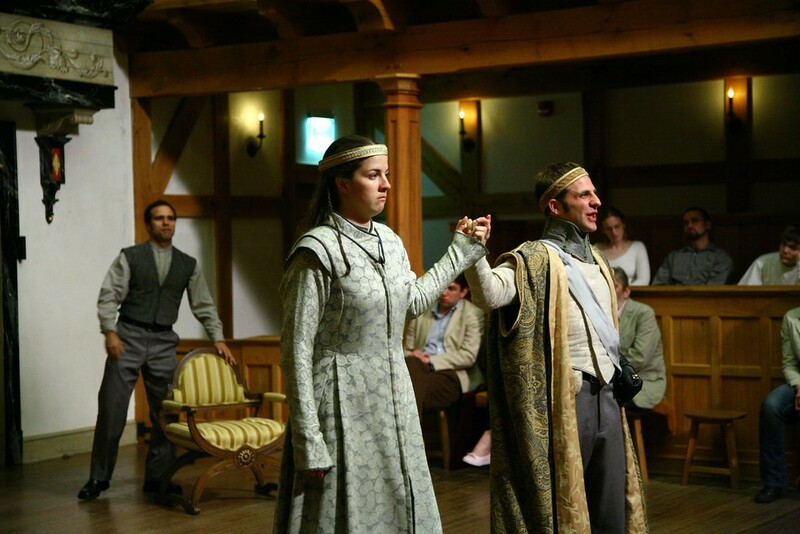 Jessica Marcus and Christopher Seiler in RICHARD III. Photo by TOMMY THOMPSON. 2006. 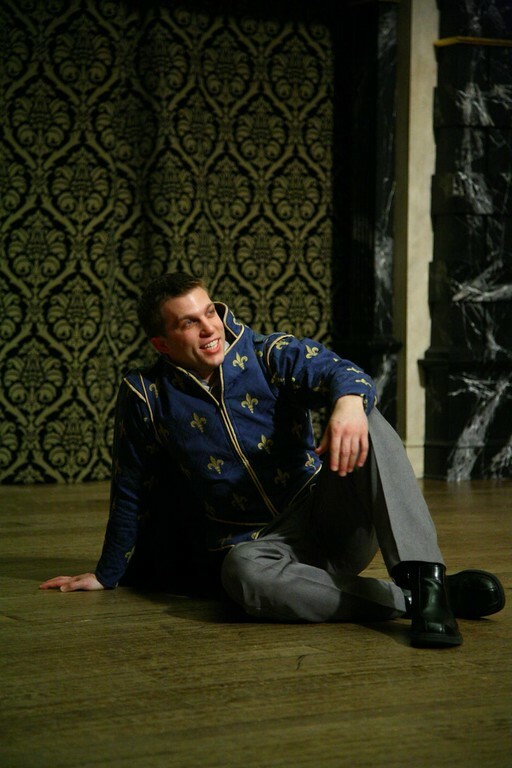 Andrew Gorell in RICHARD III. Photo by TOMMY THOMPSON. 2006. 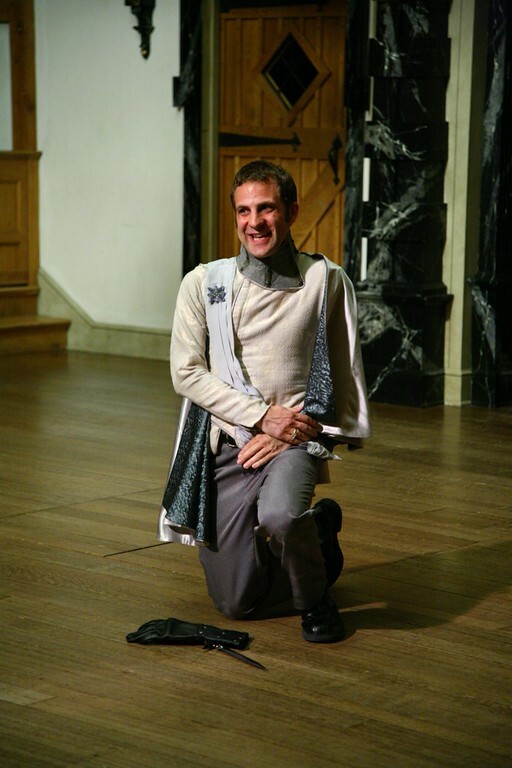 Christopher Seiler in RICHARD III. Photo by TOMMY THOMPSON. 2006. 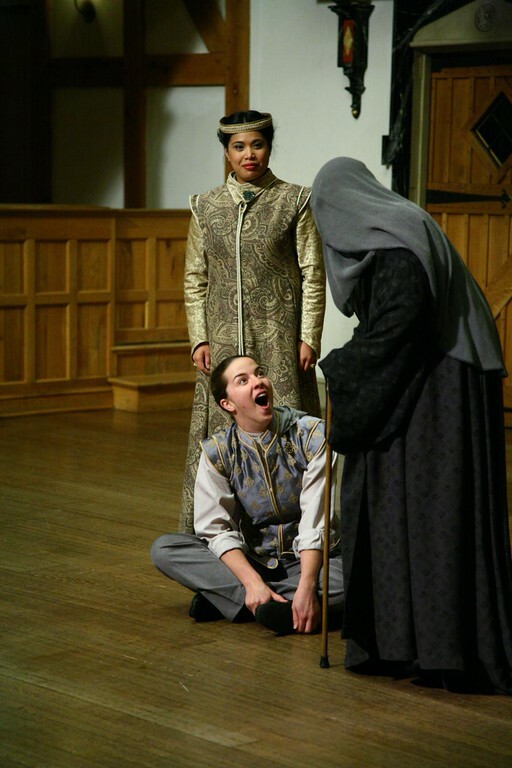 Olivia Braza, Sarah Bowles, and Alyssa Wilmoth in RICHARD III. Photo by TOMMY THOMPSON. 2006. Gregory Jon Phelps in RICHARD III. Photo by TOMMY THOMPSON. 2006. Richard III chronicles the cataclysmic end to England’s greatest power struggle, the Wars of the Roses, which pitted Richard’s House of York (the white rose) against Henry VI and the House of Lancaster (the red rose). By the end of Richard III, the two houses are joined and thus England is united. 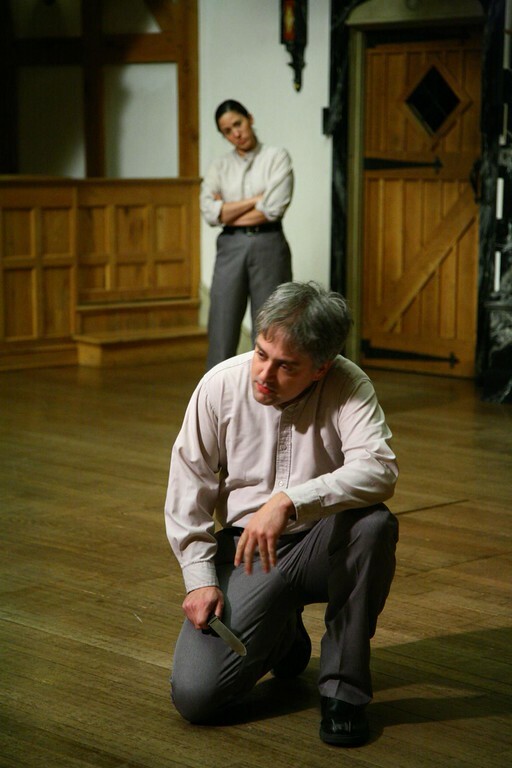 Before Richard III begins (in Henry VI, Part 3), Richard kills King Edward VI, a king who should have been a priest, making Richard’s brother, Edward, king. Richard is “determined to prove a villain” and seize the throne; he tells the audience his plans. 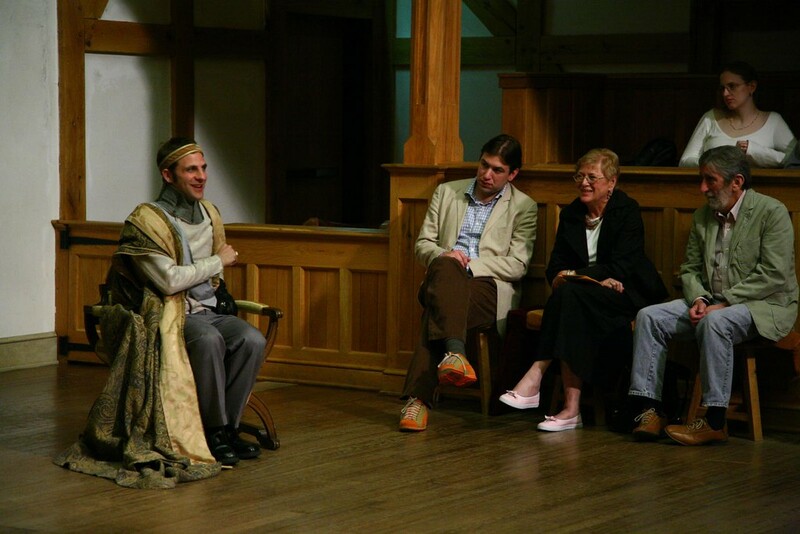 Richard’s brother, Clarence, is arrested; Richard tries to turn his brother against their other brother, King Edward IV, by telling Clarence that Edward’s wife (Elizabeth) ordered the arrest. Richard interrupts the funeral procession of King Henry VI to woo Lady Anne. Although Richard murdered Henry (Anne’s father-in-law) and Prince Edward (her husband), Richard tells Anne that he committed these acts out of love for her. Anne accepts Richard’s ring. 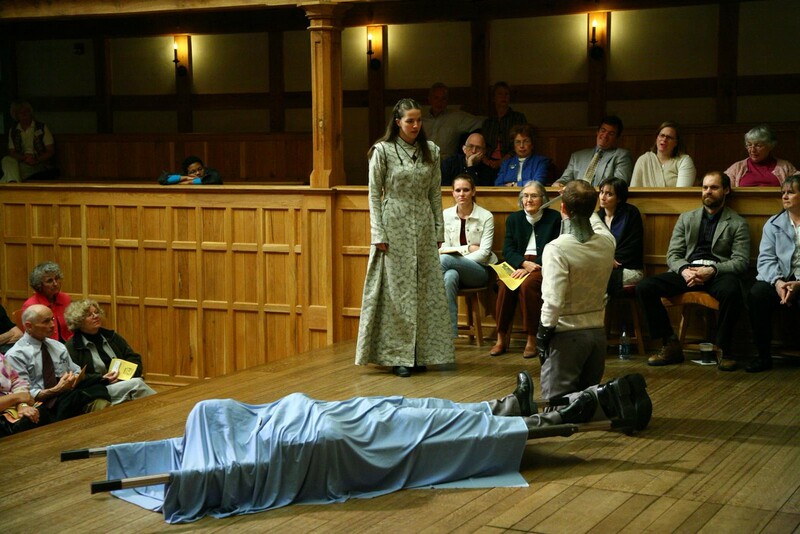 Richard confronts Elizabeth and accuses her of committing the actions he set in motion. Margaret, Henry VI’s widow, returns from banishment and predicts Richard’s downfall. Richard has assassins kill Clarence; he then goes to visit King Edward, who is near death. 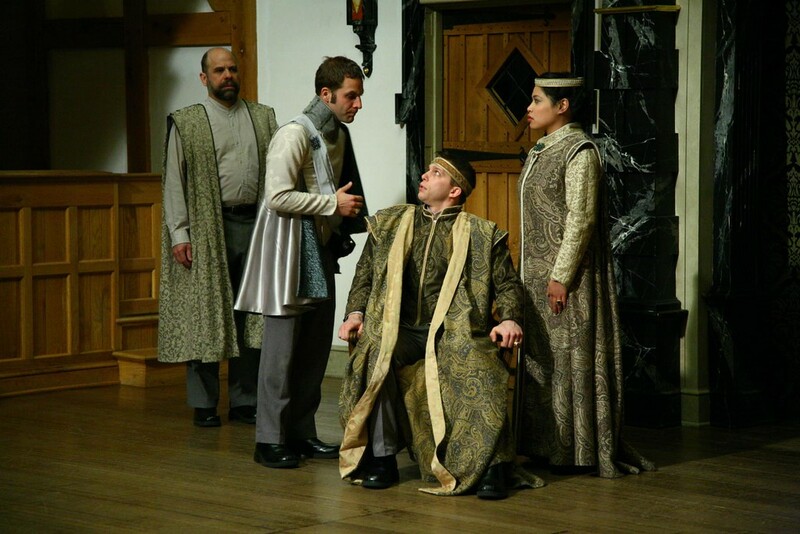 The King appeals to feuding factions (Elizabeth and Richard) for peace, and they say they agree. Edward dies believing himself responsible for his brother George’s death. Richard has Elizabeth’s relatives, Rivers and Grey, imprisoned. Richard has Elizabeth’s (and dead King Edward’s) sons “housed” in the Tower to await the coronation of Prince Edward. Richard has Rivers, Grey, and Hastings executed. Richard and Buckingham stage a scene in which Richard is “persuaded” by Londoners to accept the crown. Richard denies Elizabeth, Anne, and the Duchess access to the young princes in the Tower. King Richardwishes death on the princes; Buckingham pauses to consider his response. More murders, rebellions, battles, and history ensue. In Richard we see the beginnings of Iago – the villain who discloses to us his plans, play-acting his way through the tragedies he creates. Second only to Hamlet as the character with the most lines in any one play, Richard makes the audience his buddy more than Hamlet ever will. In Richard we have the first time Shakespeare writes a character who IS the play. The whole thing revolves around him or, more accurately, he makes the whole thing revolve. What is our fascination with the Duke of Gloucester? This “elvish mark’d, abortive, rooting hog”? It’s more than just political. Historically, the real Richard was a very different man and was innocent of most, if not all, the crimes attributed to him by Shakespeare (who used Holinshed’s biased Chronicles as his main source). Richard just happened to be succeeded by Richmond, who became Henry VII, otherwise known as Queen Elizabeth I’s grandfather, so writing Richard as a nasty villain was good PR with the Queen. Smart move. But that was for those folks in the late 1500s. What about since then? What about the five movies and various television shows and countless productions since 1591? Why Richard III? I believe it’s because he appeals to so many different types of people. He’s the champion to those of us who never really fit in; never got that date but now can woo a woman over the body of her dead father-in-law. He’s the class clown. He’s the smartest guy in the room who manipulates the world to fit his needs. He’s the pouty little boy to a mother with whom he doesn’t get along. He’s self-loathing. We can easily identify with him, with at least one of the many parts of him. And he’s funny. Who doesn’t want to make people laugh? As long as he doesn’t chop off our head most of us would be happy to be in his company for a while. It is the simplest of reasons: this is a Great play because Richard is a Great character. I write these thoughts more than one month before we start rehearsals. I look forward to the discoveries that lie ahead. I know the cast is excited to work on this play and breathe their own life into the pages. I eagerly await conjuring the spirits of the story to introduce you not only to the irresistible Richard but the fierce Margaret and the loyal Catsby and all the other characters who round out Richard’s world. This is indeed a Great play. We are honored to have you join us. I sincerely hop you have a Great time.